The first thing that comes to mind when I think of love and restriction is food. Yes, food. Hey, it’s better than my second thought, which was the time I got grounded from my first car, a week after I got my driver license. Not for one week. Not for two. It was for SIX MONTHS of restriction. I have videos of the car set to the song, “Cry Little Sister” from the Lost Boys soundtrack. It was THAT bad. What kind of parents do that to a teenager after giving them a CAR for their 16th birthday? Apparently mine, because the LOVED me. Longest six months of my entire life. Still painfully clear twenty-three years later. So you see? Forget the second thought, let’s go with the first one……contemplative cuisine; the snacking, shoveling, and wolfing of it. I LOVE food. Any kind of food, in any way. An array of delicacy to have affairs with. Pasta, seafood, sushi, steak, bread, chocolate, dairy, fruit, fast food, slow food, and any kind of mexican – any kind of bakery goods. Fried, baked, buttered, battered, or grilled – doesn’t matter. Like I said, any kind; any way. I can’t even cook. I am a foodie at the mercy of the many fine chefs mastering in their nummy kitchen heaven in the comfort of their domains. By the way, my sixteen-year old daughter wants to be a chef when she grows up. Coincidence? I read somewhere that you only savor the first bite or two of jubilant noshing, and after that you are just eating on auto-pilot inhale. Not me. I savor every morsel. Every one. With pleasure. With rapture. With complete and utter devotion to the chew. See, here is the scoop. Food lovin’ makes me gain weight. My tummy bloats. I get heartburn. It clogs my arteries and gives me muffin top. Well… bigger muffin top; like my muffin top eats your muffin top for breakfast, or my muffin top is pregnant with triplets kind of muffin top. So although, I’d like to eat a gazillion calories a day. If I did that, I’d be movable by Mack truck only. So, I restrict myself. Sadly. Tearfully. Does anyone feel my pain? That’s my restriction – the love of nummy, yummy food. Now, if you’ll excuse me. 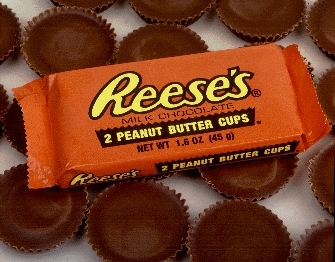 I hear a Reese’s cup calling my name. 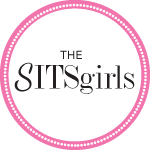 *Originally a guest post on The Scoop on Poop, re-post today, as I really need to drop some pounds before D-Day the BIG day – when I shouldn’t be too “big” eh? LOVED the humour in this one! I, too, have a love/hate relationship with food. I love to eat it – also like you, ALL OF IT – and my body rebels because of it, which makes me turn around and hate it. Why do you have to taste so goooooooooood, my dear food? And let me just say that I BARELY fit into my wedding dress on my wedding day… all because of that darned ole food and drink! We were in Jamaica living it up with friends and family for SIX WHOLE DAYS before our ceremony. And I’m telling you, I had to POUR myself into my dress. I was sucking it in during the whole entire ceremony. Luckily, I’d brought a more casual dress to change into for the reception and after, so it wasn’t so bad. If I were to do it again, though, I’d have the ceremony way earlier in the week. I so feel your pain!! I love food. And I don’t believe that first two mouthfuls bull. I savor every single mouthful. I should probably learn more about restriction. Visiting from Sits! I loved your comment on a blogging tip, I completely agree! I so hear you! I love food too, but really need to watch portion control. Oh, I so feel your pain. I LOVE to eat but sadly can only fit in the first couple of bites! Very disheartening. Hey… only a couple more weeks! Ah, relax! He loves every ounce of you! Your post made me hundry. Your pictures made me drool! 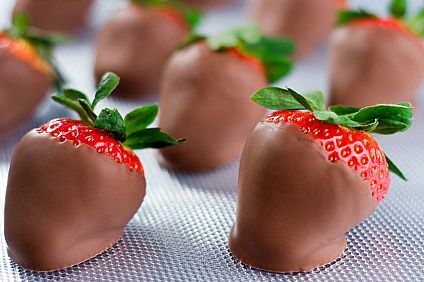 Still, those chocolate covered strawberries would be truly loves and adored by me right now! I’m off to a party tonight and I’m saving some calories because I want cake!!! I’m feeling it, as I sit here and snack on some Baked Lays Cheddar and Sour Cream. LOL! You’re so funny – “Your muffin top eats my muffin top for breakfast” made me crack up! And I’m reading this as I drink my coffee and have three mini cupcakes for breakfast. Let me tell ya about my muffin top someday! With your energy and busy life, you burn the calories as you go, go, go, girl! I have no doubt you’ll be in “good shape” for the wedding! I feel your pain as I also savor every single morsel…and you are beautiful just the way you are! I’ve been restricted from these yummy goodies the rest of my life, I know your pain, but mine has numbed me to the bone. Take that as a habit, discard restriction from your mind and you’ll be way to “wow” shape not only on the D-Day. My congratulatory note begins today for all God’s blessings pouring down on you.